It is of the fields on the west side of the B1058, looking north down into the Stour valley, and the border between Essex and Suffolk. 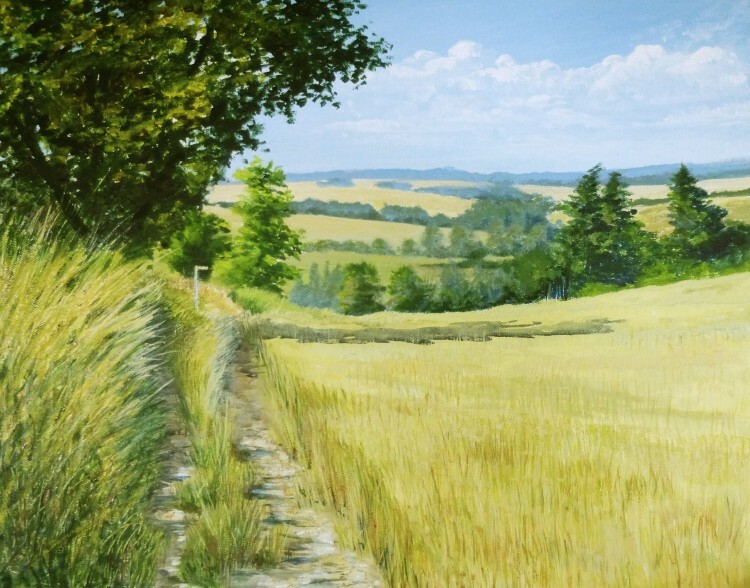 I have painted from this field before, when I did ‘Before the Harvest’ last year, but this is from a vantage point further down the field, from where you can actually see the white painted footpath sign in the distance. It is also earlier in the year, when the wheat still has that beautiful greenish -gold colour. Don’t forget the free give away -just leave me a comment to say which image you would like printed onto a jute bag before 30th August and one lucky reader will be randomly chosen to receive their bag. To leave a comment click on the BLUE title in the box on the right of your screen, and a comments box will open at the foot of the post. For all the details see the ‘Jute Bags’ post.